We have so much color outside right now, that I find myself drawn toward the black and white color combination. Handyman has traditional and conservative taste, so I often have to convince him through images that black and white doesn't necessarily have to be super modern, cold, or impersonal. 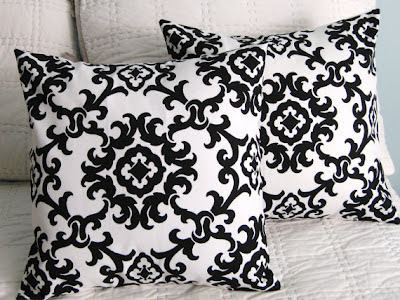 In fact, the black and white palette could work in any room of the home, from the front entry all the way through to the bedroom. Check out these images, and notice how the design is kept warming, inviting, and often traditional and timeless. This black and white entry is has the warm tones from the hardwood, and even a very neutral and beige area rug. The touches of pink could easily be swapped with almost any color such as kelly green or navy blue. I love how you can catch a glimpse of the glossy black door in the mirror's reflection. This kitchen is really a blank slate. It's well-designed with classic materials and finishes. The owner could easily influence the overall style of the space with their own accessories and personal taste. 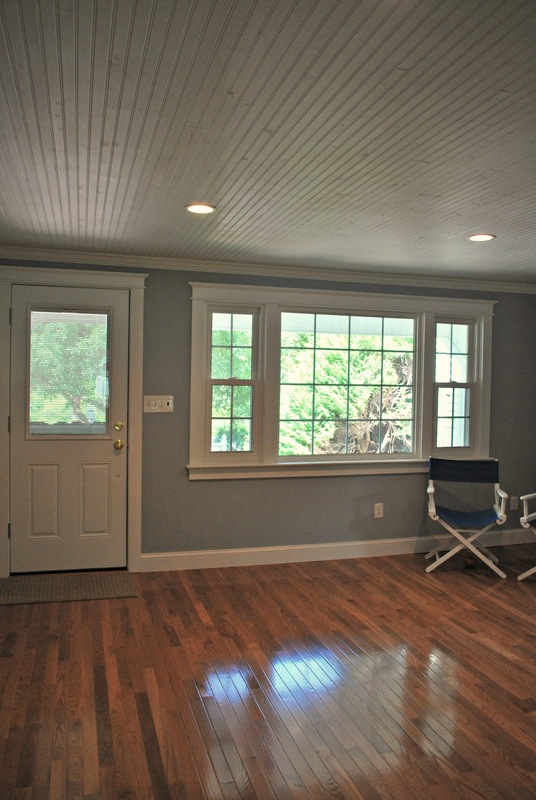 This is not an overly black and white living space. 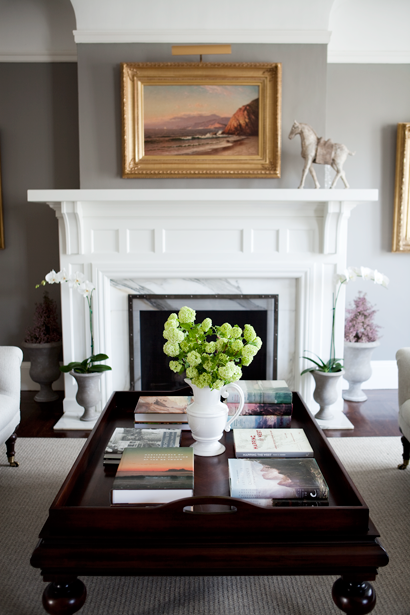 The black fireplace in contrast with the crisp white surround and mantle are the contributing black and white element of the room. The gray walls have a warm hue and the deep colored wood coffee table, along with the gold frames balance the stark contrast of the hearth area. This bedroom is a wonderful example of modernizing a more traditional look. The stuffiness of the four poster bed is toned down with glossy black paint and the striped graphic pillow and vase balance the antique oil painting. For those afraid to commit to any entirely white or black gallery space, this is a good example of both. 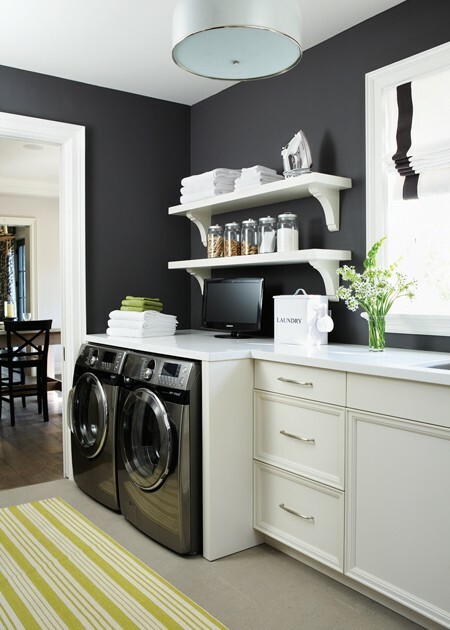 For those willing to commit to a dark wall color, this bright laundry room demonstrates a even balance of black and white. The white shelves lighten the walls, while the corbels add some charm. The window valance is simple and the adjacent room is a contrasting lighter color. And of course the striped green rug could be interchanged with any desired hue. 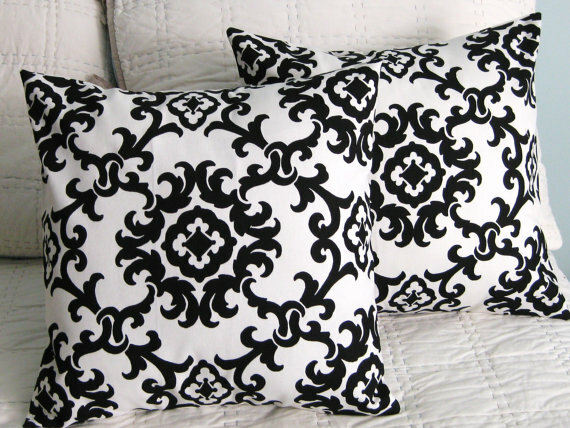 If you want to try something different, you could add a graphic black and white pillow to a neutral space, likes these cute damask pillows below. What's your favorite color palette? Hi! I love black and white with a hint of one single colour. My sister recently decorated her condo with B, W and hot pink. It looks amazing! My favourite picture you posted was the black laundry room. The walls are DARK but are totally balanced by all of that white. Love it! Thanks for your sweet comment on my sprinkle bar. I've become a follower of yours! 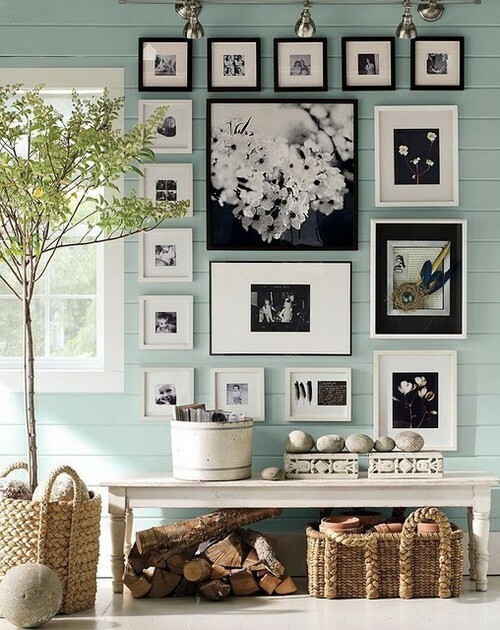 I like neutral rooms with some pops of colour here and there. I love that front entry with the huge mirror. Thanks for dropping by our blog! I'm now following you. I hope you can follow us too - we are 4 friends who share a passion for crafting. BTW, my sofa was bought at a furniture store in Toronto. Can't remember the name now because it's only a small store : ) Thanks for asking! Laura, thank you for visiting me, I am following you now :) The collection of photos you have is fabulous. Right now I have a fairly neutral scheme with lots of color for pillows, curtains, accessories etc...Fave colors now, mustard, kelly green, aqua, black, white, khaki, grey. What is the exact color of the laundry room? It is beautiful. We have a big laundry room with all white cabinets so the dark walls would look perfect in there. what is the exact color of the laundry room?